The hinged Apex II TG.35 Ultra-Wideband Dipole Antenna has been designed to cover all Cellular, ISM and Wi-Fi working frequencies in the 700-6000 MHz spectrum. The hinged Apex II TG.35 Ultra-Wideband Dipole Antenna has been designed to cover all Cellular, ISM and Wi-Fi working frequencies in the 700-6000 MHz spectrum. 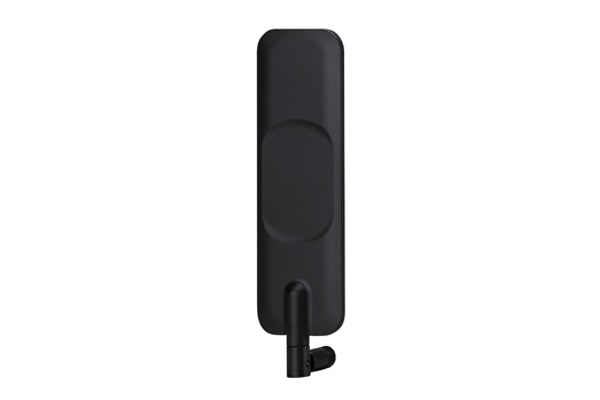 It has the highest wide-band efficiency in its range of any terminal antenna on the market today. The Apex II has been primarily designed for use with 4G LTE modules and devices that require the highest possible efficiency and peak gain to deliver best in class throughput on all major cellular (2G/3G/4G) bands worldwide for access points, terminals and routers. Vital for applications such as high speed video and real-time streaming, or high capacity MIMO networks on public transportation. The antenna is a ground plane independent antenna, meaning it does not need to be connected to the ground-plane of a device to radiate efficiently, on the other hand neither is it seriously detuned by connecting to a ground-plane, thus avoiding a problem notorious to smaller antennas. It comes with a SMA (M) connector and swivel mechanism that allows the antenna part to be rotated to fit in tight environments. The 90° hinge structure has been improved and strengthened so that the antenna in a 90° position would not fall down to 180° in vibration environment. The Apex II exhibits high efficiency and is backward compatible with 2G and 3G cellular applications such as GSM, LTE, UMTS, WI-FI and even has GPS included for Assisted GPS and/or E911 applications.